Kerala has been largely destroyed. With the temporary respite in rains, the emergency condition in Kerala appears difficult to be concluded. While the media by now has reported of more than 350 deaths and property with value of Rs 10,000 crore smashed, this may just be the tip of the iceberg. The actual report will only show up once the unreachable locations are accessed and the actual effect of the smash-up is seen. 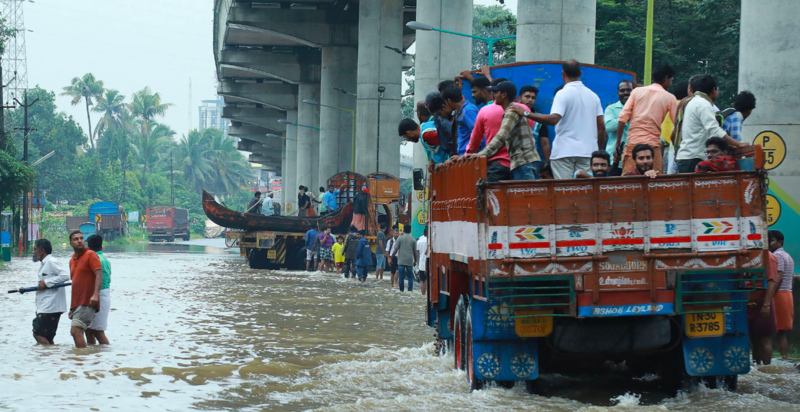 Due to this, the goods transportation industry and various businesses undergoing problems as the transport of goods to Kerala is temporarily on hold. However, keeping the safety in mind, it is necessary to keep away from the locations affected by flood. The injury caused to many lives, belongings and crops by heavy rains in Kerala this year has been of an unparalleled magnitude. The state government and the residents are expecting an unconventional response from the Central government to recompense the enormous loss the state has undergone. Governments generally present payments on the basis of loss suffered by citizens in any catastrophe. In this condition, the destruction caused due to the floods is not confined to material damage alone. Many people stranded in the floods for days with no food, no water and no medicines are emotionally shattered. Doctors feel that they may need huge psychological support to rebuild their lives. Other than this, the environment and degree of damage that the flood will inflict on the corporeal health of people is still not known. The health specialists fear that the water that swamped the homes and environs of many people might activate a huge outbreak of water-borne as well as the air-borne infections. This might be the other war-like condition that the administration might have to undergo after the flood. The state has previously been witnessing a huge eruption of epidemics during the heavy rains for a while now. The present flood is both concentrated and wide, and no one knows the types of health problems it may set off. In the midst of the outburst of sympathy and help as well as serious issues regarding dreadful ecological conditions being raised, there is a huge economic cost that is gradually becoming visible. Now, the trusted online transport service provider like Trukky has stopped the transport service to Kerala because of the safety reasons and promised to get the service back for this location soon after the situation gets better.